It was 05 June 2009 - My Birthday! I celebrated it in Ho Chi Minh, Vietnam with my sister, Ate Cielo, and my friend, Gwen. 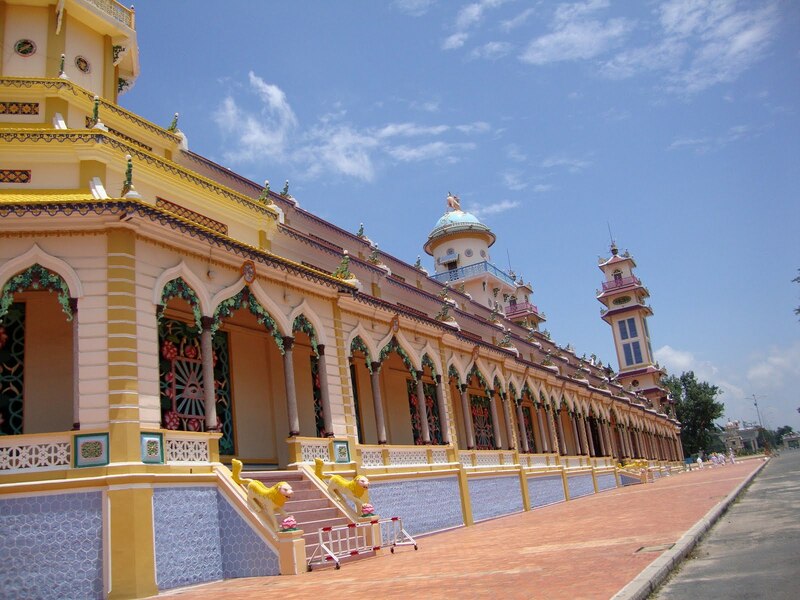 One of the places we visited there was The Cao Dai Temple located in Tay Ninh, southern part of Vietnam. CAO literally means "high" and DAI means "dais, as in a platform raised above the surrounding level to give prominence to the person on it." Put together, it refers to as the highest spiritual place where God reigns. We were in awed upon seeing the temple. It looks really nice that we cant stop ourselves from taking pictures.All going inside must remove their footwears (shoes,sandals,etc) and hats before going in. The temple was big and decorated artistically and symbolically. You can take pictures inside of the temple itself but it must not include any person posing in it. It was nearing their prayer time when we arrived and we thought that we need to leave the place because of it. But we were informed that we can stay and witness how they worship. It was quite a scene -all of them wearing white and lining up accordingly (as if it was assigned for them eversince) on the ground floor. And on the second floor was their choir, joined together in a circular formation. Tourists will really find this place worth visiting. So in case you plan to go to Vietnam, do take time to go here.